We've been following Matt Gross around the world for years. As the Frugal Traveler columunist for the New York Times, his on-the-road exploits were the stuff of dreams. The man went everywhere. His recently released memoir, , is a charming account of what happened when he let himself wander. In this excerpt, he is in India, pondering the voyager's dilemna: Am I a traveler or a tourist? There were times, of course, when proper sightseeing was inescapable. On my first trip to India, for a wedding in 2003, my friend Sandra and I stayed in New Delhi with her friend's family, in a big house next door to the Saudi Arabian embassy. It was December, and Delhi was chilly, misty, grungy, and a bit boring, and since Sandra and I had several days to kill before the multiday wedding began, we decided to explore. Luckily — sort of — the father of our host family owned a tour company (also, the exclusive rights to import Cuban cigars). All we had to do was show up, and a trip was mapped out for us. We would drive through Rajasthan, go on a tiger safari, and finally see the Taj Mahal. Rajasthan, the arid but colorful state southwest of Delhi, was fine. Mostly, I remember visiting a lot of forts. Impressive, old, fascinating forts. Forts that seemed to mean a lot to the guides who wanted to take us to one after another after another. But had I not gone to a single fort, I know now I would not have missed them. Even though, as I said, they were just fine. The tiger safari, however, had me and Sandra much more excited. Tigers! Early one morning, we clambered into the open back of a jeep along with twenty other tourists, a mix of Indians and Brits, and sped into . Down the bumpy hardpacked roads we went, our guides warning us not to get our hopes up too high. With just twenty-six tigers living in 150 square miles of jungle, they couldn't guarantee a sighting. But look, there was a deer! And over there — a colorful bird! Around this time, a British man with a drooping face, grayish complexion, and unfashionably thick glasses began to grumble quietly to himself. About the crowding here in the Jeep, about the difficulty in seeing anything the guides were pointing out, about the cold weather. Sandra and I began to speculate about him: Why was he here at all, and alone? He looked to be in his mid-fifties, and we concluded he was either a widower or divorced, and his friends back home, in an effort to cheer him up, had convinced him to take this trip to far-off India, whose exotic action would make his life vibrant again. It didn't seem to be working. Suddenly, the Jeep slowed to a stop. Beyond a thin line of trees to our left, a vast field dotted with ponds and streams. A guide pointed into the field, and there, in the middle of it, almost hidden in the deep grasses, was a tiger! A real tiger. We held our breath. The tiger got up. It walked, lazily, as tigers do, across the field. All were silent, motionless, awestruck — except for the Brit, who muttered about how he couldn't actually see the tiger. And once he could, once he'd fixed on its position, once he'd watched it saunter majestically out of the woods and into the road two hundred yards ahead of us, he announced, in a clearer voice than before, "It's like watching paint dry." Then the tiger disappeared into the thicker woods on the other side of the road. It was about 10 a.m., and our guides and drivers, formerly worried we might not see a tiger, had a new problem. We'd seen a tiger, yes, but we still had four hours left on the tour, and if we were going to be honest about things, there wasn't much else to see in Ranthambore National Park except tigers. Deer and colorful birds are fine, but after you've seen a tiger, they're like Cheerios to a child who's tasted Froot Loops. And so, with four hours to go, miles and miles of road to cover, and nothing left to see, the driver stepped on the gas. And so, for four hours, through miles and miles of forest, Sandra and I and the sad Brit and everyone else huddled in the back of the Jeep, suffering through hard incessant jouncing, shivering in the wind chill. A kind Indian woman loaned the sad Brit her silk scarf, and he'd draped it over his head and shoulders to keep warm; he looked ­suicidal. Near the end of this unpleasant voyage, the Jeep pulled to a stop so that we could, incredibly, gaze upon a second tiger as it loped in the distance. And then, when it had gone, the Jeep zipped back to the park's entrance, and we achingly returned to our hotel — a threadbare, insect-ridden "resort" where our attempts at sleep were interrupted by the rumble of trucks on an unseen highway, like dinosaurs lowing in the distance. Early the next morning, Sandra and I fled. We'd been scheduled for another tiger safari (in case we hadn't spotted one the first day), but that did not seem advisable. Instead we rushed to the train station, where we admired the "Rogus [sic] Gallery," a wall decorated with photos of known thieves and pickpockets, then turned around to watch an organized gang of monkeys rob a passerby of his bag of mangoes. At last we boarded the third-class train that would deposit us somewhere near Agra, and from there we caught a bus to the city — and the great Taj Mahal. The Taj Mahal — built by a seventeenth-century Mughal emperor in memory of his third wife, visited by millions of awestruck visitors every year, one of the finest pieces of architecture in all of India, if not the world — is, in my humble estimation, quite symmetrical. Really, that's about all I have to say about it. The Taj Mahal is beautiful and inspiring and so on, but its perfectionism — embodied in that attention to symmetry — didn't resonate with me. I wanted flaws, I wanted quirks, I wanted a human connection. Instead, our guides emphasized its flawlessness, its precision, its holiness. To me, those attributes are boring. What bothered me about the Taj Mahal, and much of our sightseeing in India, was the feeling of obligation that surrounded it. If you were in northern India, it felt expected, almost required, that you'd go there. 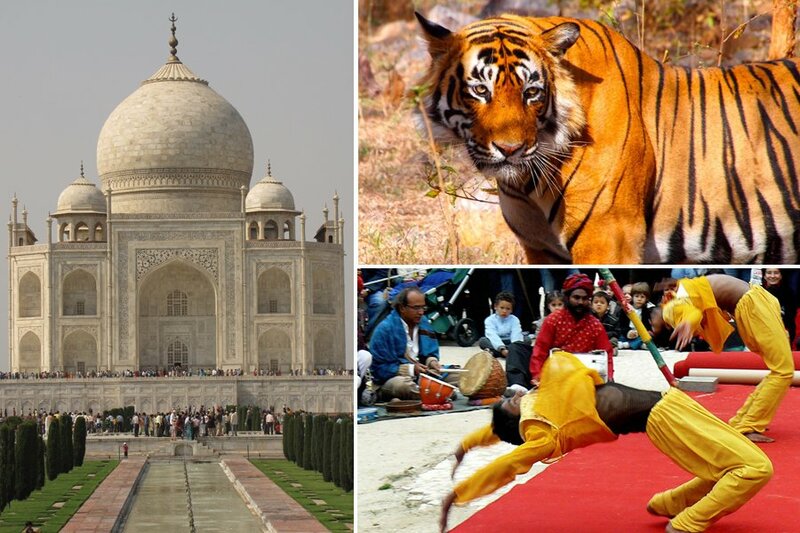 Otherwise, why else would you have come to northern India, if not to see the Taj Mahal, the forts, the tigers? Although I understood the reasoning, I still bristled at such expectations. Why should I spend my time and money on things and places I'm not interested in, especially when so many other, overlooked experiences beckon? After the Taj Mahal, Sandra and I had to figure out a way to spend the afternoon, and I had an idea. All over town, I'd seen posters — in lurid Day-Glo colors — advertising the circus. We had to go! And we did. That night, in the company of the guides hired by our friend's father's company, we watched clowns joke in Hindi, and motorcyclists drive upside-down in mesh spheres, and poorly trained acrobats leap, tumble, and fall, then get up to do it again. After a brief moment of calm, a hippopotamus appeared from behind a curtain. Led by its trainer, it stumbled around the ring and opened its cavernous mouth, into which the trainer tossed a cabbage. Then it stumbled back behind the curtains. Amazing! Granted, this was no Barnum & Bailey, but the circus performers were trying, with what little resources and talent they had, to put on a show, here in this city where a circus could never compete with the Taj for the public's attention. No one laughed or cheered at anything that night — not even the children in the audience. I've never understood why not. But I do know that Sandra and I cheered and laughed all the harder to make up for it, and that next time I wind up in Agra, I'm crossing my fingers the circus is in town. But that Mughal tomb? Eh. Seen one Taj, seen Mahal. From by Matt Gross. Reprinted courtesy of Da Capo Press. is the editor of . You can follow him on Twitter at . He travels for the hell of it.